The South African Sunday Times reports that special forces entered Lesotho just before Saturday’s pre-dawn raid on the house of Prime Minister Tom Thabane and whisked him across the border to safety. The paper reports that South African troops, who are based in Phalaborwa, Limpopo, had moved into Lesotho on Friday afternoon and were accompanied by a group of diplomats. But the Sunday Times article is questioned by a well informed source I have been in contact with. They say the story is not true. The South African government has been trying to broker a peace deal in the mountain kingdom for more than two months. Trouble has been brewing in the country since June, after Thabane dissolved parliament amid rumours that MPs were going to pass a vote of no confidence against him. Mothetjoa Metsing of the opposition Lesotho Congress for Democracy says he has taken control of the country. A report by the Institute of Strategic Studies provided the context to the current instability. This is by no means the first time South Africa has intervened in Lesotho. In September 1998 South African and Botswanan troops entered the country to restore order in Operation Boleas. In June this year there were further rumblings of trouble in Lesotho. Within a month President Jacob Zuma had made a ‘working visit’ to the country. Officially this was to “strengthen bilateral relations.” But in August it was announced by Lesotho that President Zuma’s closest business partners, the Gupta brothers, had been appointed advisers to the Lesotho government. Prime Minister Tom Thabane explained this had been at President Zuma’s suggestion. The Guptas were granted diplomatic passports, something they had been seeking (unsuccessfully) from South Africa for some time. Opposition parties in Lesotho were furious and condemned the decision. “We find it as a serious insult to our nation,” said the Democratic Congress. Prime Minister Thabane denied receiving money from the Guptas. “I have not taken a penny from the Guptas. I am not corrupt. Check with all the banks the world over… I have not received any money from them,” he said. He also defended the Guptas as “solid businesspeople” with a good track record in both business and in assisting the ANC “since the days of Mandela while he was still in prison”. Here the prime minister was wrong. The Guptas arrived in South Africa in 1993, well after Nelson Mandela’s release from prison. Since then they have gone on to become extremely wealthy, with a penchant for treating South African government property, including the airbase at Waterkloof, as their private property. The Zuma family and the Guptas are now closely interlinked, as reported by the BBC in 2013. The ties between the President Zuma and Prime Minister Tom Thabane are strong; the Guptas are the string that binds them together. 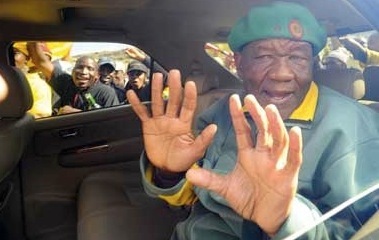 From the safety of South Africa Tom Thabane insists he is still in charge – and will soon return to take control.